Former Grundfos Group president and board chairman Niels Due Jensen, who has just turned 75, has stepped down as chairman of the board of the Poul Due Jensen Foundation, the primary owner of Grundfos. Niels Due Jensen’s father Poul Due Jensen established Grundfos in 1945. In 1960, Niels Due Jensen started an apprenticeship as a machine tool worker at Grundfos, and after serving in the military, he studied to become a machining engineer at Aarhus Teknikum. He worked as an engineer at Danfoss for a few years, and returned to Bjerringbro and Grundfos in 1974, rejoining as development engineer, and later becoming a director. When Poul Due Jensen died in 1977, Niels Due Jensen assumed the overall leadership of the Grundfos Group, serving as president and CEO until 2003. 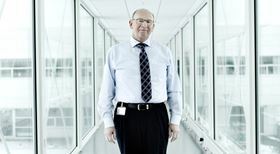 From 2003–2011, he was chairman of the board of Grundfos. He has been chairman of the board of the Poul Due Jensen Foundation since 2011. Today, the Grundfos Group employs 19 200 people, has 83 companies in 56 countries and is the world’s largest circulator pump company. “Niels is unique. He often refers to his father’s many ideas and visions for Grundfos, but Niels is the one who made Grundfos the world’s largest pump company and the technological leader of the industry. In addition, he inherited his father’s ability of understanding and knowing the customers, making us able to stay one step ahead of our competitors,” said Mads Nipper, Group president and CEO of Grundfos. “Things are good at Grundfos, and I think that also the softer values are being taken good care of, so I feel comfortable about handing over the baton. It has been a pleasure and a privilege to have done so much for the customers in collaboration with skilled, engaged and competent employees through more than five decades. Now, I will allow myself a little spare time, enjoy nature, the role as a grandfather, and maybe do a bit of travelling. I will still drop by Grundfos to make sure that everything runs as it should,” said Niels Due Jensen. Jens Bager, the former CEO of ALK Abelló, is the new chairman of the Poul Due Jensen Foundation, while Niels Due Jensen’s daughter Annette Due Jensen joins the foundation’s board. Grundfos Egypt's new branch in Alexandria is part of a drive to expand its distributor network and service facilities across the country. Grundfos is working with Valuer to connect with global entrepreneurs. Catherine Yang becomes regional managing director of Grundfos's China sales region from 1 March 2018.